This release has been quite long in the making. We have post-poned this release due to works on the QuickBooks integration which was originally planned for later in the year. So there are many changes big and small! We have quietly released our QuickBooks integration at the beginning of this month. Now we are adding additional bells and whistles. Soon you can expect a complete integration with Supplier Automation and all the classes / tracking categories that QuickBooks supports! Line item view - if you always export a supplier with line items, you can now choose to have the line item view as default for this supplier's invoices. 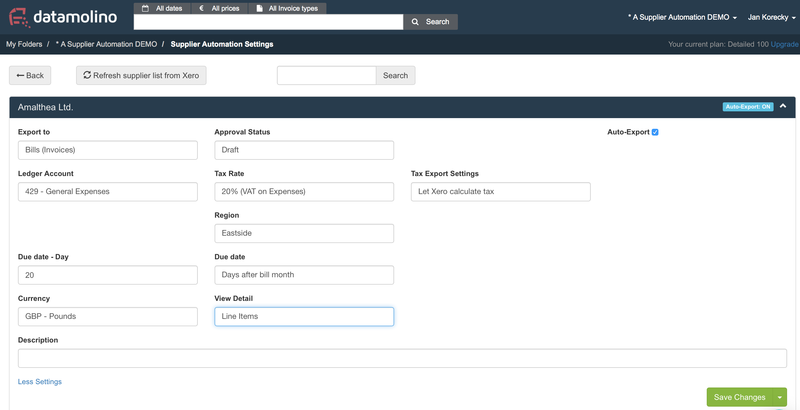 We have improved how Supplier Automation handles the line items. The default coding is now reflected on the line item level. You can also auto-export line items, if you set the "View detail" to "Line items" and turn on "auto-export". The checksum above the line items now indicates whether the lines add up to the Total of the invoice.